Most of us have experienced Android’s management of links in various apps. One example is scrolling through Twitter and finding a link to an Instagram photo that you’d like to view. Clicking on it will take you to Chrome, where you will face the short wait for a t.co redirect, and then to Instagram. Chrome, in this case, is just an unnecessary middleman. Link Bubble is a new app from the highly-successful Chris Lacy looking to remedy this flaw. It provides you with a nifty bubble to load redirects in the background and take you straight to where your link ends up, along with additional useful features such as a handy way to add links to Pocket. Another possible use case of Link Bubble is when you want to click two links on a page. For example, if you’re reading an article in Feedly, you can tap one and then the other, and they will both load in the bubble off to the side of your screen. 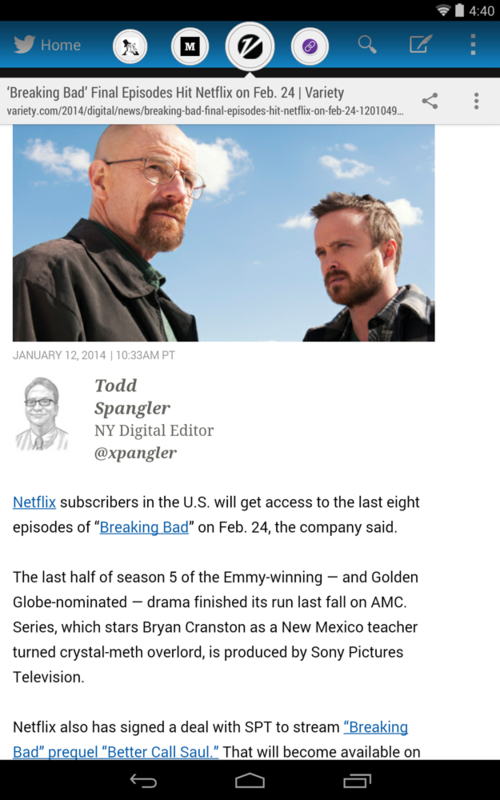 You can then tap it to view both links, and easily jump right back into Feedly. You can also click on links, and then drag their bubble straight onto the Pocket icon to read them later. Unfortunately, we don’t have support for other read-it-later platforms such as Instapaper, but it’s easy to see how saving a link could be nifty in a pinch. The final current feature of Link Bubble is the ability to load embedded YouTube videos on a webpage directly in the YouTube app. The default Android method for opening embedded videos is quite trashy, and opening links in the regular YouTube app from embeds has not been the easiest thing to do, but we can finally view videos without the hassle. 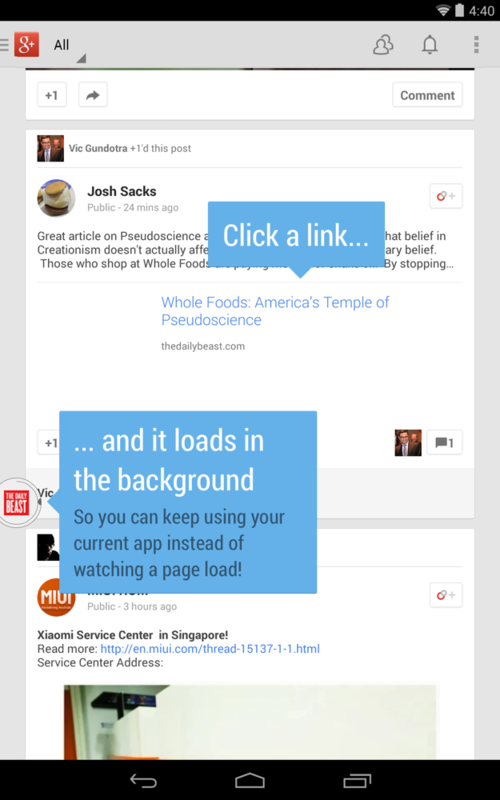 Link Bubble’s flick physics allow you to go from clicking a link to sharing a link or adding it a service such as Pocket in little more than a second! Load multiple links from your current app at the same time (requires Pro). Gracefully handling links that redirect to other apps. No longer does clicking an Instagram link in Twitter redirect to a full screen browser before loading Instagram! Deep integration with the apps on your system. Locates embedded YouTube videos on web pages, and provides a shortcut to load those videos directly in the YouTube app. 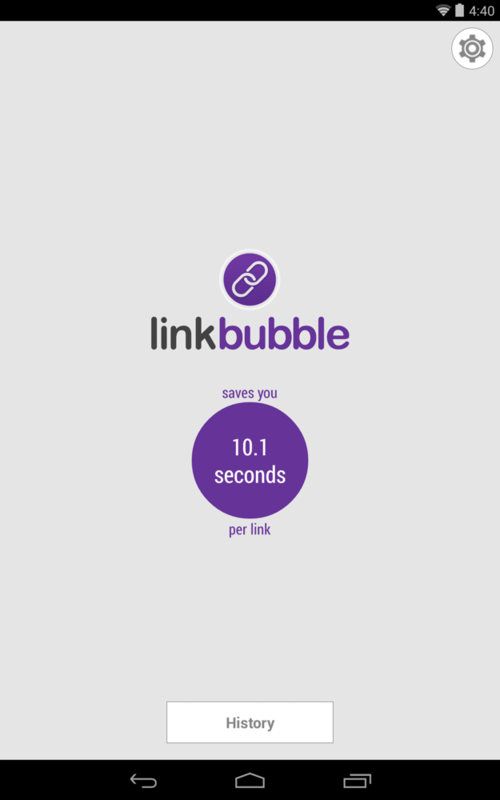 Handy stats that illustrate how much time you are saving by using Link Bubble. Link Bubble is broken apart into two components. A free version is available with the features listed above, but the $4.99 pro version allows for an infinite number of tabs, link importation from all your apps, and supporting the developer’s future projects.